This pdf clocks in at 2 pages and is a 5E-mini-dungeon. This means we get 2 pages content, including a solid map and all item/monster-stats hyperlinked and thus, absent from the pdf, with only deviations from the statblocks being noted for the GM. Oh, and the series now comes in an archive that also contains…*drumroll* a .jpg-version of the map, in both GM and player-friendly versions! Since this product line’s goal is providing short diversions, side-quest dungeons etc., I will not expect mind-shattering revelations, massive plots or particularly smart or detailed depictions, instead tackling the line for what it is, a helpful tool in the GM’s arsenal. Got that? Great! How does a river break? Well, in this instance, easily, for its origin is not natural, but a set of decanters of endless water. 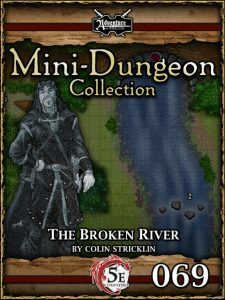 While dangerous, the river must be recreated and erosion thwarted – as such, the PCs explore a pretty dangerous place, including weird critters and special ore that attracts magic…and the module actually also notes further adventuring options! This is pretty cool…however, less scrupulous PCs could abscond with the potent items, which can be problematic. Editing and formatting are very good, I noticed no significant glitches. Layout adheres to a beautiful 2-column full-color standard and the pdf comes sans bookmarks, but needs none at this length. Cartography is full color and nice. Huge plus: We get a GM AND a Player-version of the area in which this takes place, providing full VTT-friendly compatibility. Colin Strickin’s little sidetrek is a fun adventure worth checking out. The premise is magical and interesting and the execution neat, with further adventuring baked into the module for the GM’s convenience. Nothing to complain here. The conversion by Chris Harris is solid. My final verdict will clock in at 4 stars. You can get this sidetrek here on OBS.